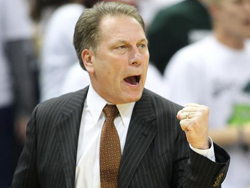 You know Coach Izzo is fired up! Are you? Get to a game! You know you can make at least one of these home games work! Got a young child just getting into basketball? Treat them to a Big Ten game and watch their smile grow as fast as the Spartan lead. Havent seen your old college buddies in a while? Get off the couch, pick up some tickets and treat them to a walk down memory lane! Shoot, maybe your wife or girlfriend went to Oakland, or Arkansas-Pine Bluff! Come watch her Alma Mater get stomped, Spartan Style! Get to a Spartan Basketball game this December, its pure Green and White Glory and puts watching the game on TV to shame.